Besides, she is indeed my sister, the daughter of my father but not the daughter of my mother; and she became my wife. As leaders, we are to be people who speak the truth. Of course, there are times when we have to hold things in confidence. We know things that should not be broadcast to the world or even, at times, whispered to our spouse. Yet, when we speak, we ought to say what is true. Sometimes, however, it isn’t even that simple. Take the case of Abraham in Genesis 20. When he and his family were living in Gerar, he announced that his wife, Sarah, was his sister, much as he had done when they journeyed to Egypt in Genesis 12. And, once again, the ruler of that area, King Abimelech, took Sarah for himself. And, as happened with Pharaoh in chapter 12, the king got into trouble with the Lord. In this instance, God spoke to Abimelech in a dream, telling him that he was about to die because he took a married woman for himself. Abimelech protested that he did not know she was married. After all, Abraham had said “She is my sister” and Sarah had agreed. In response to Abimelech, the Lord offered to let him off the hook if he returned Sarah to Abraham. Did Abraham tell the truth to Abimelech? Yes and no. He told part of the truth but omitted the part that was the most consequential. We might say that he spun the truth for his own benefit. In the process, he endangered both his wife and Abimelech. We may never find ourselves in a predicament quite like that of Abraham. Yet, we who lead often confront the challenge of how to tell the truth well. We know how to say true things that actually deceive. We might even be tempted to say true things that hurt others because they are partial truths. I’m not suggesting that it’s always easy to know, as a leader, what to say and not to say. But I am convinced that we need to bring our words and motivations before the Lord, who knows all things, including our hearts. We need to learn how to say the truth that ought to be said, from God’s point of view. We need our hearts to be formed so that we will know when and how to speak the real truth. Have there been times in your life when you have been deceived or hurt by half-truths spoken to you by someone in leadership? Have you ever said things that were true, even while sensing that you were not saying other things that should have been said? What will help you to be a leader who is known for truthfulness? Gracious God, once again I thank you for the example of Abraham. His deceptive telling of a half-truth challenges me to examine my own behavior. Are there times, Lord, when I have done as Abraham did, speaking the truth but failing to say what should have been said? Even now, am I not saying truth that ought to be said? Give me wisdom, Lord, to know how to speak the truth wisely. Give me courage to say what needs to be said. May I be a leader known for truthfulness. To you be all the glory. Amen. P.S. If you’re looking for a deep discussion about truth-telling, I might mention that I wrote a whole book on the subject: Dare to Be True. 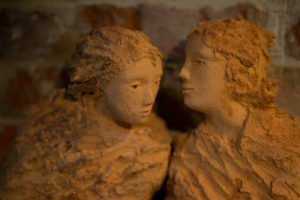 Image Credit: “Whispering Girls” by Lexe-I – CC BY 2.0. This post originally published on October 16, 2015.